In this chapter, we explain what we mean by deviance in social media . We give examples of four types of deviance as observed on social media, viz., deviant acts , deviant events , deviant tactics , and deviant groups . We provide historical information, definitions, and examples that will be studied/explained in more details throughout the book. 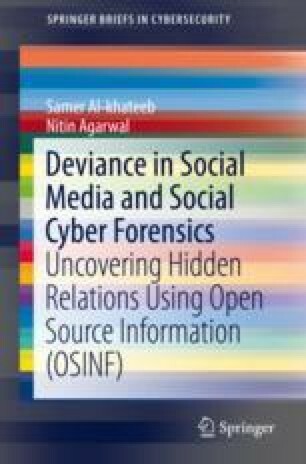 This chapter would help the readers understand the scope of the problem of deviance in social media, familiarize with definitions and examples of deviant events, groups, acts, and tactics, and peek at the social science theories that can explain such emergent deviant behaviors on social media. G. Ackerman, D. Blair, G. Butler, H. Cabayan, R. Damron, J.D. Keefe, T. King, D. Hallstrom, S. Helfstein, D. Hulsey, et al., The New Face of Transnational Crime Organizations (TCOs): A Geopolitical Perspective and Implications to US National Security (Calhoun Institutional Archive of the Naval Postgraduate School, Mar. 2013). https://calhoun.nps.edu/public/handle/10945/30346.